Stained glass is an incredibly durable material but like most things, it will steadily decline. Pieces of glass may crack, chip or fall out. The wood frames and leading on stained glass can sag or bend under the weight of gravity and little by little time will start to take its toll. Another constant source of damage to stained glass church windows is the environment: chemicals in the air, pollution and UV rays all degrade either the stained glass itself or its supporting lead and wood structures. Because no stained glass window is impervious to breaking down over time, the stained glass on your church will eventually need to be restored or repaired. You may have noticed some early signs of aging on your church’s windows but don’t know what to do about it or if you should do anything. The best thing to do then, is to have an expert come out and take a look at your church windows. This will let you know the extent of the damage and the scope of the repair. It may actually not be time for a restoration to your church’s windows but, if restoration is needed, it is best to do it before the window gets too bad. Once a window is in too much disrepair, extremely high restoration costs could be a possibility or the window may be beyond repair. 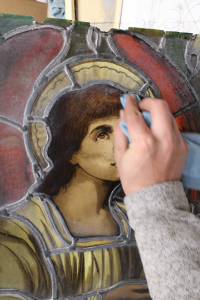 Church stained glass restoration is a process that often involves more than one person making decisions and entrusting your churches prized stained glass to a craftsman for repair–and therefore is delicate in many ways. Who you hire to do your restoration is very important and should be researched and weighed heavily. No one understands this better than we do at Houston Stained Glass. We have over 30 years of experience, 40,000+ windows to our credit, and numerous accolades, which makes us arguably one of the leading stained glass companies not only in Texas but in the entire United States. Our approach to church restoration projects is simple: extreme reverence for the history and beauty of each piece and respect for the congregation and setting in which the stained glass lives. We know all too well that the value of a church stained glass window is more than just monetary–because sentimental value is something that can never be replaced. For these reasons, we are always happy to evaluate your chapel’s stained glass windows while taking into account both their value and history. We then will recommend a course of restoration action to a church leader or committee. Our quotes include a thorough breakdown of scope and price of work, as well as, a timetable of repairs with all the details on what is needed to get your church stained glass windows restored to their original luster and beauty. Since our company’s creation almost three decades ago, we have continually created and restored stained glass with techniques both new and old. We have worked with stained glass artwork for nearly every type of denomination and architecture: cathedrals, temples, mosques, synagogues, and more. Our highly-skilled craftsmen have a deep understanding of the stained glass art form, know the intricate processes and use most cutting-edge techniques to restore them precisely to their original depth and beauty. As one of the country’s best, our company has been spotlighted in various media outlets such as HGTV, NBC, CBS, and the DIY Network. When you choose Houston Stained Glass for your church’s stained glass restoration you are choosing the highest quality available for your church’s cherished stained glass and the difference will show. Contact us today for a free, on-site consultation for your Houston churches stained glass restoration!